There are multiple ways to stand in boxing; however, you cannot box well without getting your stance just right. 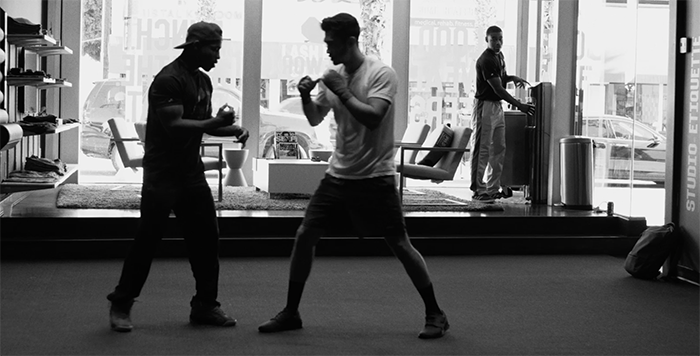 While the way you stand is dependent on your posture and strength, working to reach a proper boxing stance can immediately improve your stability, power, and speed. If you want to learn more about how the correct boxing stance can help you, read on for technique tips and tricks from the coaches at Gloveworx. When you stand in a proper boxing stance, there are many subtle changes that immediately make it easier to find a stable fighting position. Your punches reach farther without forcing you to overextend your stance into a vulnerable position. You’re also less likely to lose your balance when you have to react quickly. A good stance allows you to throw a wider variety of punches without leaving you too exposed. You’ll have more power, balance, and mobility the moment you find your stance. Stand up straight and place your feet shoulder length apart. Shift one of your feet slightly in front of the other, keeping them mostly parallel to each other. Plant your front foot flat on the floor and raise the heel of your back foot slightly off the ground. Bring both hands up just above your chin, keeping your elbows tucked in to your sides. Slightly bend your knees as if you are going to squat. Balance your weight 50/50 between the front and back leg. The foot you place in front will change depending on whether you are right or left handed—Orthodox (right handed) or Southpaw (left handed). Orthodox fighters should place their left foot in front, while Southpaw fighters should place their right foot in front. Finding the proper boxing stance takes time and a little bit of trial and error, but if you follow these steps, you’re heading in the right direction. Remember, all power in boxing comes from the ground up, so your stance is a critical component to get right. If you’re not sure about your stance, grab a coach next time you’re at Gloveworx and ask them to help!